Happy to have another opportunity to serve them, I decided to make the delicious vanilla bean cupcakes for today’s Bake for Japan event. But I wasn’t thinking. This was a bake sale not a school party, and at the last minute it dawned on me that I needed the cupcakes individually wrapped. Uh oh. Not wanting to spend a crazy amount of money on ready-made cupcake boxes (though they are very cute), I came up with this idea. Of course others have already had the idea and I don’t know why it didn’t occur to me until this morning, but Todd brought home a pack of clear plastic cups from the grocery store and we combined those with the treat bags to do this. 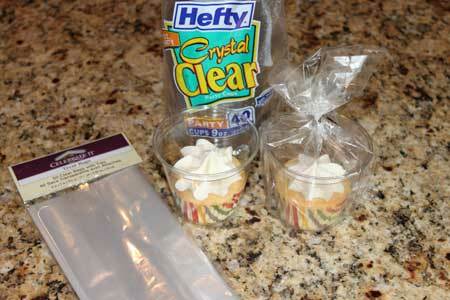 The cups were Hefty Crystal Clear 9 oz and were the perfect fit for a standard size cupcake. The treat bags were a brand called “Celebrations” which we found at Michael’s, and they fit snugly around the cups holding the cupcakes. 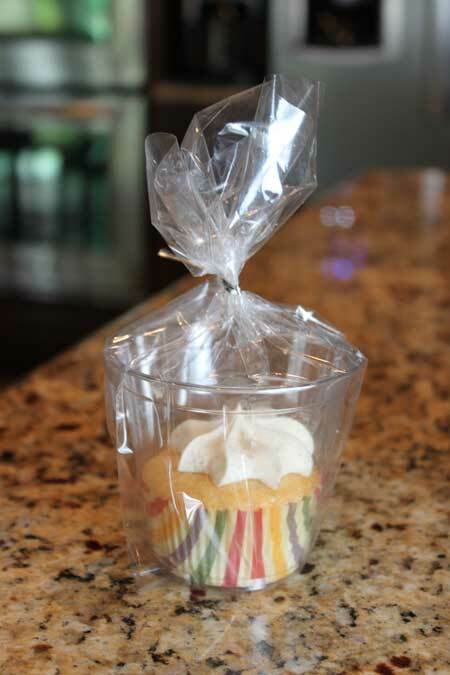 You just stick the cupcake in the cup, gently turn the cup on its side (it’s good to frost the cupcake in a way where there’s a rim of cake between to frosting between the paper and the frosting), slide the cupcake into the bag and tie off the end. Because of the big twisty tie tops, I only fit 12 cupcakes in the top level of the carrier, which I didn’t even really need to use since the cupcakes fit so securely in the Hefty cups. I could have just thrown them all in a box! As for the bake sale, I have lots of photos to post and will share them a little later. While you might think one little bake sale wouldn’t do much, proceeds from our bake sale combined with other Bake for Japan events going on around the city and country, probably did make an impact. Do you also share your cute tag? The only problem with that is most grocery stores don’t sell lidded fountain drink cups. You could buy them on-line, but at that point you might as well buy cupcake holders or clam shells. There are tons of options! Mine is more of a quick and easy thing to put together with clear cups and treat bags — things that are easy to find. I recently saw on Pinterest the idea of putting the cupcake on a fountain drink lid (or some flat disc) and using the clear disposable cup on top of that (upside down from our usual way of thinking about a cup). That made retrieving the cupcake much easier and no mess, plus it keeps the very time consuming decorating part intact. How do you get the cupcakes out without ruining the decoration? Nice job improvising!! I’m definitely going to try your idea since I always have Ziploc bags and cupcake liners on hand. Thank you… Thank you! I’m baking cookies for a fundraiser for my daughters cheerleading squad and I was searching the internet for ideas on how to package the cookies (since they need to be individually wrapped) when I came across your idea. I didn’t have either the cups or the clear treat bags (only yellow duckies), so I improvised. I used cupcakes liners, then I cut the zip off the zip-lock bags, put the cookies in the c-cake liner, put them in the bag and wrapped a bread tie (that I found in another box of bags) around it. Then I tied ribbon around the bag using the school colors red, white and blue. It just happens to be “Memorial Day” weekend as well. Hi Lynne! It’s less messy than you’d think. I guess frosting usually sets a bit, so even if the frosting rubs against your finger a little, it doesn’t spread all over the place :). Good question, though. Great idea. 🙂 When the person receives the cupcake, how to they take it out without getting frosting all over there hand? This is a great idea. I am starting a cupcake business from home and been searching for weeks on how to keep the cost down. Plastic containers and boxes are so expensive! Gail, I don’t remember how much we sold those for. There were a ton of baked good donations to that particular sale, so I think we sold them for a pretty low price….maybe $2.00 max? I just wanted to ask, after you packaged each cupcake, how much did you sell them for individually? Hi Lynne, I think they were about 4×9. What size cellophane treat bags did you use? I just kind of tilt the cup and lift the cupcake out. I have a theory on how to get the cupcake out – cut a hole at the bottom of the cup that is big enough to fit a finger, but not too big that the cupcake would just drop off. Then, gently push/poke the cupcake out of the cup. It could work provided that the cupcake is sitting snug in the cup; otherwise it will wiggle and wobble and get frosting everywhere. The fit should be tight enough so that the cupcake doesn’t tip. In my experience, the cups which I mentioned in this post are just the right size to hold the cupcake. How do you get the cupcake into the cup without it tipping and having frosting all on the inside wall of the cup? I just tried it and that’s what happened to me!! Any ideas to keep the cost down? I was thinking of cheap plasic baggies….. Someone brought in cupcakes packaged like this to our recent bake sale, and they completely sold out! This was a fundraiser for our school’s marching band, and the person used our school colors for the icing on the cupcakes as well as the ribbons used to tie the celephane closed. Everyone made a fuss about them. Jumbo cupcakes? Use a clear bowl instead of a cup. I read some great ideas about putting icing at the bottom, a kiss at the bottom, adding a spoon, and cutting the sides of the container to make it easier to get the cupcake out. Thanks everyone!! I am making cupcakes for my library’s bake sale and was wondering how to package and display them also. This is a great idea. I bought a roll of clear cellophane paper for another project, but I suspect this will work out well. Thanks so much for these ideas. I appreciate it. I did this, but I frosted the cupcakes inside the cup and I also cut the side of the cup before putting the cupcake inside the cup. This made it easier to get them out of the cup when you wanted to eat them. I donate for bake sales all the time~~this is PERFECT!!!! Thank you!!!! This is a great idea. 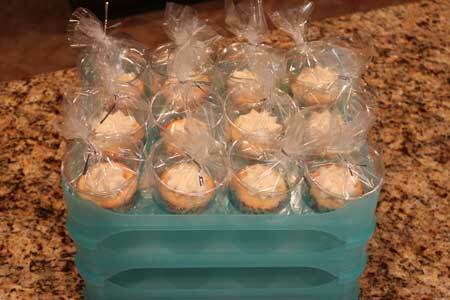 I need to package about 600-700 cupcakes really easy and this is a great way to do it cheaply. The one thing that was bothering me was getting the cupcake out of the cup. So I am going to fill the bottom half of my cups with that filler stuff that you put in easter baskets. I hope this works. Just an idea. I also like the idea someone put out about unwrapping the cupcakes so they can eat it right out of the cup! To make it easier to take the cupcakes out of the cup, cut two slits in the plastic cup (one on each side) before you insert the cupcakes. That way, you can slightly open the cup making it easier to remove the cupcake. Wow! This was so clever. It worked on my kids Fair this past Saturday, all cupcakes were sold in a matter of minutes! Thank you so much! I placed 4 Hershey Kisses upright on the bottom of the cup, sat the cupcake on top, and piped my icing with the cupcake in the cup. Perhaps the recipient will have to lick her/his fingers when s/he removes it, but Yummmy! I gave these as favors for a baby shower. I used your idea of dropping it into a cup, but I unwrapped the cupcakes first, placed a bead of frosting around the bottom of the cup, placed the cupcake in the cup (the frosting in the bottom keeps it in place for transit), then I frosted and decorated, put the cup in a clear bag, and tied the bag with a ribbon with a spoon tied into it. That way, the person enjoying the cupcake doesn’t have to figure out how to get the cupcake out of the cup without getting messy fingers or spoiling the icing. These were a huge hit!! I’m hosting the LA Food Blogger Bake Sale in a week and you just saved my life with this post. Thank you so much! I usually dont leave comments…but this idea is wonderful! The Secret Sisters at my church will be doing a bake sale in May and I was looking for clear cupcake/cake& pie containers and seen your idea! How clever!!! Thank you so much for shareing! Thanks Paula! I didn’t know it was on Pinterest. In fact, I haven’t tried Pinterest yet. Sounds pinteresting ;). Hmmm, my first thought would be to see if you can find bigger cups of some sort. If you come up with something, let me know. I make jumbo cupcakes on occasion, but haven’t had any need to package them. Thank you so much for the idea…….Any suggestions for the Jumbo sized cupcakes??? thanks to Woman’s world for great ideas on cupcakes also. Is this suitable for shipping? like will the frosted get messed up or stick to the roof of the box? (plus you know that the mailman or people might not be careful). I have an idea for cheaply packaging a dozen (a little time consuming), if you have cardboard, colored paper, plastic wrap, and curling ribbon. Cut a square out of a side of a box/or cardboard to fit number of cupcakes. Cover it with your choice of coverings (tin foil, colored paper). Either individually pkg the cupcakes (in plastice cups/clear wrap) or just stick them to the covered cardboard (use icing to stick). If not in cups, create decorated toothpicks using stickers or curling ribbon on one end. Use the toothpicks to keep the clear wrap from touching the cupcakes. Close clear wrap over the top with ribbon. I have not done it yet…so I apologize in advance if it doesnt work…I am starting the process now. love this idea! will definitely be using it! Sorry that sounded confusing. What I mean was that when you frost the cupcake, don’t frost it all the way to the edges. For instance, I frosted the vanilla cupcakes with a big star tip so that there is a big star of frosting in the center of the cupcake, but it’s surrounded by a ring of unfrosted cake. That way the frosting won’t rub up against the side of the cupcake when you turn the cup on its side to put it in the bag. Cool idea! But what is this saying? “…where there’s a rim of cake between to frosting between the paper and the frosting…” I re-read that part a few times but it didn’t make sense to me. Super good idea for packaging cupcakes. It looks really sharp too! Thanks. The vanilla bean cupcakes sound delicious. Out of all of the exciting flavors of cake, vanilla continues to be my favorite and I love the little dark vanilla bean flecks. It just adds to pleasure. I would prefer to have a bigger blob of icing on top but then again, I’m a person who can eat buttercream frosting by the spoonfuls! Genius idea for individual packaging. What a great idea! I had one of those hit-my-head-in-the-forehead, why-didn’t-I-think-of-that reactions when I saw it. I’ll bet they sold well. What a nice idea. Great idea and also look great for presentation… but I am also wondering how difficult it is removing the cupcake from the cup without destroying the frosting presentation? Will the frosting get all over the person’s hands trying to get it out? Is the person meant to eat the cupcake out of the plastic cup with a fork? This is a great idea and one that I probably wouldn’t have thought of! Thanks! In addition to a cook book, I think you should have a book of just tips and tricks -it would sell out! You think like a grand prize winner! Love this idea. Thanks so much. Just in time for a bake sale I am baking for next week. Presentation is sooo important. And this is not only convenient and economical but attractive–great idea. A hit, I’m sure and for a good cause. BTW, modestly of course, I have to say I had a clever April Fool’s Day cookie idea, too. Please take a peak–the pic is designed to fool the eye. Brilliant! And what great awesome success for the bake sale donations! When I saw your recipe choice several days ago, I wondered how you were going to package them. Nice job. These are absolutely adorable! 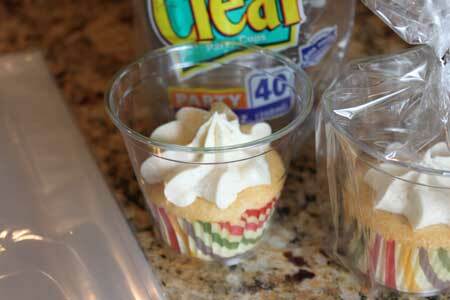 One question though…are the cupcakes hard to get out of the cups without squishing them or messing up the frosting? OMG this is pure genius. Anna, you are brilliant. Haha. I am a closet reader of your blog. Follow it religiously. Have an appetite for the sweets. Love it! I was actually wondering if you’ve come across any healthy or low-calorie desserts (fruits are NOT a dessert LOL:P) for those of us unwilling and unable to ever cut desserts out of our life-style? Thanks 🙂 You post such delicious recipes. The fat kid in me can’t help but want to make them all! Brilliant! You save us all a lot of time and effort by sharing your tips. What a great idea Anna. This will really be a useful thing to do. Pure genius! Never thought of this idea! Thank You so much! Anna, I’ve never seen this done but it is the perfect idea! Thanks for letting us in on it. Anna, thanks for the tip as I have a big bake sale planned for the fall. GREAT idea for transporting cupcakes! Thanks for sharing that. I always end up taking cupcakes to the track at least once per season. (Last year I did it three times.) This is so much easier and more sensible than what I’ve been doing. That’s really clever and cute too! 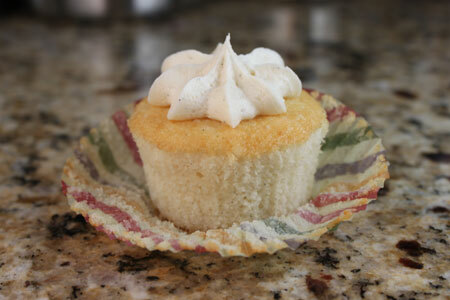 Those vanilla bean cupcakes are on my list to make soon. Tonight though I’m making Martha Stewart’s oatmeal crisps: http://www.marthastewart.com/260418/oatmeal-crisps?xsc=eml_cod_2011_03_26. Hope they taste good. They sure were easy. this is what i will do for this summers farmers market. excellent idea and way cheaper too!